Goal seeking in Excel allows you to approach calculations from the "result end" and get Excel to tell you what inputs you need in order to hit a specific target. Read on to find out how it works! Normally in Excel you create a calculation to find out what result you get from a specific set of input values. You can then change the input values to see a new result calculated. Goal seeking allows you to approach that process from the opposite direction: when you have a calculation set up you can manipulate the calculation to obtain a specific result and get Excel to tell you what inputs you need in order to hit that target. You can watch a video version of this goal-seeking tutorial. This system has two inputs (the green cells) and one calculation (the orange cell). At what price we would have to sell the current quantity to meet the target. 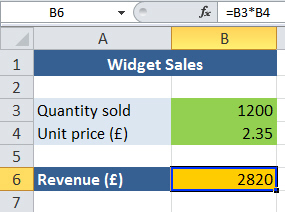 Select the cell containing the calculation you want to alter the result of. In our example this is cell B6. Here we're setting the result of the formula in B6 to a value of 5000 by changing the value in cell B3 (the quantity in our system). Click OK to ask Excel to try to find a solution for the values you have entered. If a solution is found you can click OK to keep the values Excel has set, or click Cancel to revert to the original cell values. You can run another goal seek on the same cells as many times as you like, trying different combinations of values each time. 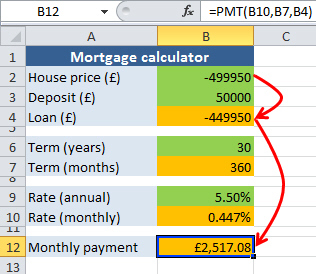 As in the above example, green cells represent inputs and orange cells contain calculations. Even though the value of cell B2 doesn't feed directly into the calculation in cell B12 in the above example, we can still use goal seeking to influence their values. For this example we'll imagine that we couldn't afford a monthly payment of more than ï¿½2,400 and we want Excel to tell us what the maximum house price would be if all of the other inputs stay the same. Using these settings Excel should tell us the maximum house price we can afford while keeping our monthly payments manageable. We lose a significant chunk from the value of house we can afford, but at least we'll be able to keep up with the payments!